It's a vibrant and energetic musical, but it's also a Childish Gambino vanity project in which Rihanna doesn't sing. Donald Glover described “Guava Island” as “one of my favorite projects I’ve ever worked on,” and it shows: Every minute of this hour-long short film/music video hybrid exudes the passion of the team behind it. Directed by Hiro Murai, who also helmed the beloved “This Is America” video and has earned acclaim for his work on “Atlanta,” “Barry,” and “Legion,” it’s nevertheless billed as a Childish Gambino film — and that may be its Achilles heel. For all of the film’s vibrant energy, “Guava Island” isn’t a standalone work so much as a tie-in to its creator and star’s ever-ascending career that offers limited rewards to anyone who isn’t already on board. It’s made with care and precision — cinematographer Christian Sprenger, who also works on “Atlanta” and shot on grainy 16mm, is the absolute MVP — but there isn’t much content behind the craft for anyone who isn’t already a Glover superfan. 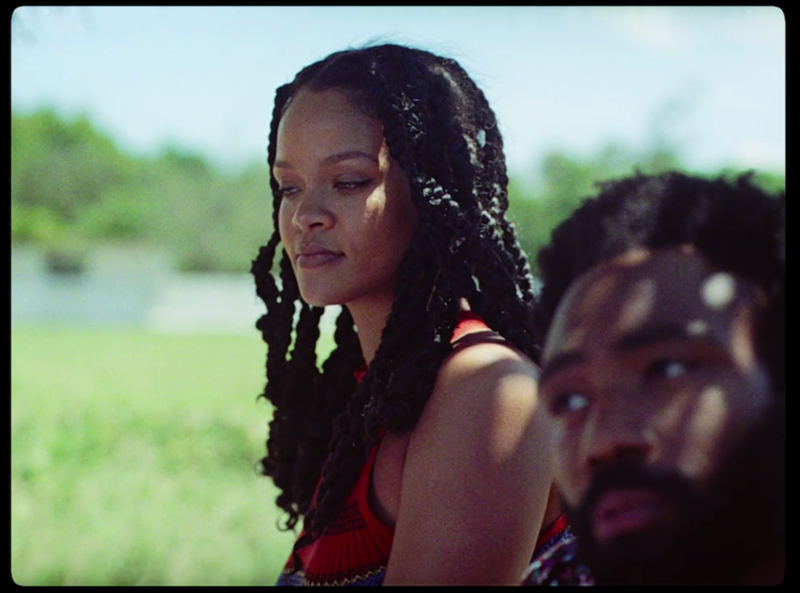 Rihanna and Letitia Wright co-star, but both take a back seat to the acting, singing, and dancing of Glover as he merges his cinematic persona with his musical alter ego. The blurring of that line is occasionally fascinating, especially with both names appearing in the credits. That Glover would go the surprise-premiere route makes sense; it’s increasingly common in the era of Spotify and Tidal, and he’s mastered the art of making everything he does an event unto itself. News of “Guava Island” came close to breaking the internet when it was announced a few days ago, before its actual premiere April 12 at Coachella after his headlining performance as Gambino. However, the actual film feels like a vanity project that never rises to the heights of something like Beyoncé’s “Lemonade,” still the high-water mark for this kind of venture. “A very, very long time ago, long before the birds, cars, and even coffee beans, the seven gods of the seven lands created the dueling truths: love and war,” Rihanna’s narrator intones. The gods decided humans needed a small refuge from them — an island, in fact. The island was a paradise, which is to say that its inhabitants eventually ruined it. The five-minute prologue is animated in a striking 2D style that eventually gives way to live action as the story of Guava comes into focus. However, it’s really the story of Glover’s character, with everyone else relegated to background roles. He plays Deni, whose dreams are too big for the small island. “What’s wrong with me is that we live in Paradise, but none of us have the time or means to actually live here,” he says after rushing to his job at the docks following a gig playing guitar on the radio, which is where his passions lie. He then gets on a literal soapbox and says “America is a concept,” making explicit the link between this project and Glover’s revered song from last year — as does the song-and-dance routine that immediately follows. It isn’t the only one, and “Guava Island” is a true hybrid that, in less hip times, would simply be called a musical. Despite that, Rihanna herself never sings, and her impressive vocal range is unmatched by her acting chops. She still feels underused — why cast such a high-profile performer in a project like this and give her so little to do that plays to her talents? Deni’s last name is Maroon, which brings to mind a passage from Jean Rhys’ Jamaica-set, anti-colonial novel “Wide Sargasso Sea”: “Now we are marooned, what will become of us?” The word “marooned” is often used to describe those trapped on an island, and in Jamaica it was also the name for runaway slaves. Guava Island doesn’t exist in the strictest sense of the word, of course, but Glover’s use of it as a metaphor is effective when this project feels like it’s about more than just him — even if he’s overly blunt in his messaging. With lines like “in the end, what else do we have but dreams?” and “practice is perfection,” though, that bluntness is too frequent to overlook. “Guava Island” is a nice enough place to visit, but an hour there is more than enough. “Guava Island” is available to stream on Amazon Prime.